It has been found that chronic rhinosinusitis (CRS) increases the risk of developing nasopharyngeal carcinoma (NPC). CRS can be caused by gastro-oesophageal reflux (GOR) that may reach nasopharynx. The major component of refluxate, bile acid (BA) has been found to be carcinogenic and genotoxic. BA-induced apoptosis has been associated with various cancers. We have previously demonstrated that BA induced apoptosis and gene cleavages in nasopharyngeal epithelial cells. Chromosomal cleavage occurs at the early stage of both apoptosis and chromosome rearrangement. It was suggested that chromosome breaks tend to cluster in the region containing matrix association region/scaffold attachment region (MAR/SAR). This study hypothesised that BA may cause chromosome breaks at MAR/SAR leading to chromosome aberrations in NPC. This study targeted the AF9 gene located at 9p22 because 9p22 is a deletion hotspot in NPC. 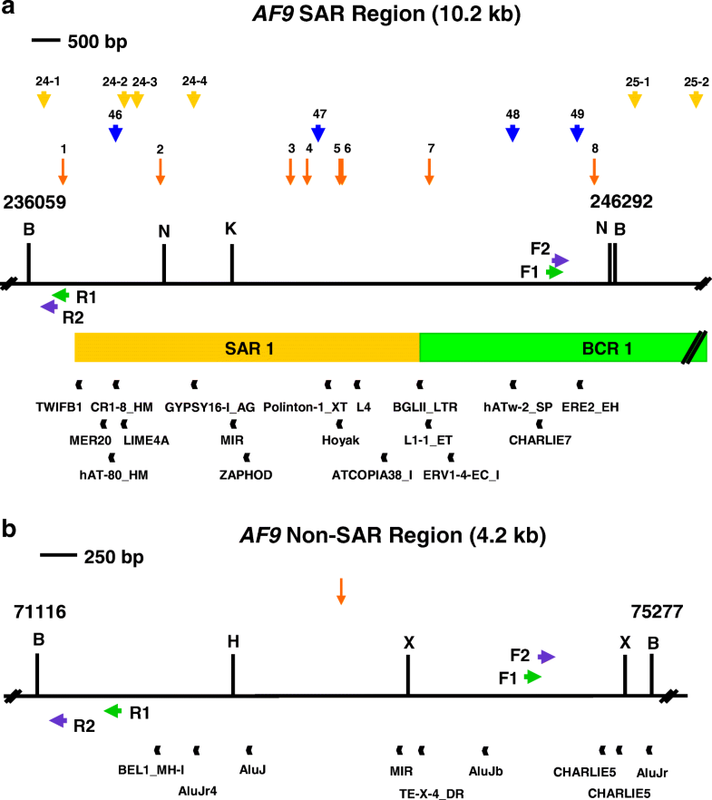 Potential MAR/SAR sites were predicted in the AF9 gene by using MAR/SAR prediction tools. Normal nasopharyngeal epithelial cells (NP69) and NPC cells (TWO4) were treated with BA at neutral and acidic pH. Inverse-PCR (IPCR) was used to identify chromosome breaks in SAR region (contains MAR/SAR) and non-SAR region (does not contain MAR/SAR). To map the chromosomal breakpoints within the AF9 SAR and non-SAR regions, DNA sequencing was performed. In the AF9 SAR region, the gene cleavage frequencies of BA-treated NP69 and TWO4 cells were significantly higher than those of untreated control. As for the AF9 non-SAR region, no significant difference in cleavage frequency was detected between untreated and BA-treated cells. A few breakpoints detected in the SAR region were mapped within the AF9 region that was previously reported to translocate with the mixed lineage leukaemia (MLL) gene in an acute lymphoblastic leukaemia (ALL) patient. Our findings suggest that MAR/SAR may be involved in defining the positions of chromosomal breakages induced by BA. Our report here, for the first time, unravelled the relation of these BA-induced chromosomal breakages to the AF9 chromatin structure. Genetic alterations , epigenetic changes , and environmental factors  are thought to be involved in the development of nasopharyngeal carcinoma (NPC). Several environmental risk factors that contribute to NPC have been identified. These include Epstein-Barr virus (EBV) infection [4, 5], dietary exposure to nitrosamines  as well as occupational exposure to smokes, wood dust, formaldehyde and intense industrial heat [6–8]. In addition, prior history of chronic nose and ear diseases (such as chronic rhinitis, sinusitis and otitis media) has also long been recognised as a risk factor for developing NPC [9–15]. Individuals with chronic rhinosinusitis (CRS), the inflammation of the nose and paranasal sinuses, have been shown to have a significantly higher risk of developing NPC as compared with the control individuals without CRS . Although chronic inflammation of nose or ear has long been recognised as a risk factor for NPC, the underlying mechanisms by which this risk factor may contribute to NPC pathogenesis remain elusive. Gastro-oesophageal reflux disease (GORD) is one of the major aetiological factors of chronic inflammation of sinonasal tract or ear [16–20]. GORD is caused by the flowing back of gastric duodenal contents into the oesophagus. It has been reported that the gastric duodenal refluxate may flow beyond the oesophagus. In turn, the gastric duodenal contents may affect the tracheobronchopulmonary tree, larynx, pharynx, sinonasal tract and middle ear [18, 21, 22]. The typical GORD symptoms such as heartburn and acid regurgitation may not be present in half of these patients . Thus, these atypical manifestations of GORD are not only referred as extraoesophageal reflux (EOR) or laryngopharyngeal reflux [18, 23] but also as ‘silent reflux’ . GORD is related to various inflammatory disorders. These inflammatory disorders include gastritis [24, 25], oesophagitis [26–28], laryngitis [29–31], pharyngitis [32, 33], post-nasal drip , otitis media [35–38] and asthma [39–41]. Moreover, the relation between CRS and GORD has increasingly received much concern [33, 42, 43]. It has been reported that individual with GORD has a significantly higher risk of developing CRS . The prevalence of acid pharyngeal reflux in patients with CRS has been found to be higher than that in the normal controls (64% vs 18%) . Seventy-eight percent of patients with CRS has been observed to have GOR . Nasopharyngeal reflux has been demonstrated in both paediatric [46–49] and adult groups [34, 42, 43, 50]. Besides, GORD has also been related to various cancers. These cancers include stomach cancer [51, 52], oesophageal adenocarcinoma [53, 54], laryngeal cancer , pharyngeal cancer  and lung cancer . Bile acid (BA), the major component of acid refluxate has been identified as a carcinogen in human malignancies (reviewed in ). It has been found that the levels of total pepsin and BA in the saliva of patients with laryngopharyngeal reflux were approximately three-fold higher than those of the normal volunteers . It has also been reported that the levels of total pepsin and BA in the saliva of early laryngeal carcinoma patients were about four-fold higher than those of the normal controls . In addition, BA has also been shown to have the carcinogenic effect in human hypopharyngeal squamous carcinoma FaDu cells through epithelial-mesenchymal transition (EMT) . EMT is a major pathway related to cancer invasion and metastasis . These observations suggested a potential role for biliary reflux in the pathogenesis of laryngeal and pharyngeal cancers. There are strong associations among oxidative stress, inflammation and cancer [63–65]. Oxidative stress may activate nuclear factor-kappa B (NF-kappa B)  which plays a vital role in inflammatory response . The activation of this transcription factor leads to the expression of genes involved in inflammation . On the other hand, the inflammatory condition generates excessive reactive oxygen species (ROS) in cells. The free radicals may interact directly with DNA or interfere with DNA repair system. These, in turn, elevate the mutation rate in the inflammatory cells. Therefore, chronic inflammation predisposes the cells to neoplastic transformation. Cytokines have been found to be the important mediators that relate inflammation to cancer through oxidative stress . It has been demonstrated that the combination of BA and acid triggered NF-kappa B activation in human hypopharyngeal epithelial cells. This, in turn, leads to overexpression of genes associated with antiapoptosis and oncogenic properties . NF-kappa B pathway is well known to be a proinflammatory signalling pathway. This pathway is mainly activated by proinflammatory cytokines such as interleukin 1 (IL-1) and tumour necrosis factor-alpha (TNF-alpha) . ROS are known to act as the messengers in NF-kappa B activation. It has been found that the anti-inflammatory cytokine IL-10 was able to inhibit the NF-kappa B activation in the stimulated macrophages via reduction of ROS . It has recently been reported that the level of BA in the serum of NPC patients was significantly higher than that of the normal controls. The level of BA in the serum of NPC patients significantly inhibited the secretion of the IL-10 protein in CD4+ CD5- T cells . IL-10 is suggested to have an anti-inflammatory role through reduction of oxidative stress induced by the proinflammatory factors. Treatment of Caco-2 intestinal epithelial cells with proinflammatory factors such as TNF-alpha, serotonin, adenosine and melatonin has been shown to induce oxidative damage in proteins and lipids. IL-10 was found to be able to reverse the oxidative damage by restoring the activities of antioxidant enzymes such as catalase, superoxide dismutase and glutathione peroxidise . It has also been demonstrated that IL-10 inhibited hydrogen peroxide (H2O2) generation triggered by interferon (IFN)-gamma or TNF-alpha-activated macrophages . Our previous study provided clear evidence that BA triggered oxidative stress in normal nasopharyngeal epithelial and NPC cells. The effect of BA in the induction of oxidative stress was enhanced by the acid . These findings unravelled a possibility that oxidative stress provoked by the acidic gastric duodenal content may be a vital factor leading to the inflammation-induced carcinogenesis in the nasopharyngeal epithelium. It will be intriguing to investigate the relation between BA and proinflammatory or anti-inflammatory factors in the context of direct exposure of the nasopharyngeal epithelial cells to the refluxate. In addition, BA-induced apoptosis has been suggested to be a possible mechanism underlying the pathogenesis of Barrett’s oesophagus, oesophagus adenocarcinoma and colon cancer [76–78]. Chromosomal cleavage is a hallmark of apoptosis. Initially, the chromosomal DNA is being cleaved and detached from their binding sites on the nuclear scaffold. The release of rosettes and loops of chromatin produces the high-molecular-weight (HMW) DNA of 200 to 300 and 30 to 50 kbp, respectively [79–81]. In the later stage of apoptosis, the HMW DNA is further degraded into internucleosomal DNA fragments of 180 to 200 bp [82, 83]. In our previous study, we demonstrated that BA was able to induce apoptosis in normal nasopharyngeal epithelial and NPC cells. We further demonstrated that BA-induced apoptosis resulted in chromosome breakages within the AF9 gene. These chromosome breakages were abolished by the caspase-3 inhibitor. Given that caspase-3 is the primary activator of caspase-activated DNase (CAD), our findings suggested that CAD may play an important role in mediating the chromosomal cleavages during BA-induced apoptosis . It has been observed that the apoptotic nuclease CAD is closely associated with the nuclear matrix in the cells undergoing apoptosis . Chromosomal DNA binds to the nuclear matrix through matrix association region/scaffold attachment region (MAR/SAR) . It is plausible that when CAD cleaves the chromosomal DNA, it potentially cleaves at MAR/SAR. Thus, we hypothesised that BA-induced apoptosis may cause DNA breakages preferentially at MAR/SAR sites leading to chromosome rearrangement in NPC. Our study focuses on the AF9 gene which is located at 9p22 because 9p22 is one of the deletion hotspots in NPC . In the present study, we performed in silico prediction of MAR/SAR within the AF9 gene. We demonstrated that the AF9 gene cleavage frequency within the SAR region was significantly higher in BA-treated cells as compared with the untreated control. By contrast, there was no significant difference in the AF9 gene cleavage frequency within the non-SAR region between BA-treated and untreated control cells. Our results suggest a role for MAR/SAR in defining the positions of chromosomal breakages mediated by BA-induced apoptosis. NP69 normal nasopharyngeal epithelial cell line was generously provided by Prof. Tsao Sai Wah (The University of Hong Kong, Hong Kong, China) and Prof. Lo Kwok Wai (The Chinese University of Hong Kong, Hong Kong, China). TWO4 NPC cell line was kindly given by Prof. Sam Choon Kook (formerly from University of Malaya, Malaysia). Keratinocyte-SFM medium (17005–042), RPMI 1640 medium (21870–076), penicillin/streptomycin (15140–122), L-glutamine (25030–081) and fetal bovine serum (10270–098) were bought from GIBCO, Invitrogen, USA. Taurocholic acid sodium salt hydrate (T4009), sodium glycochenodeoxycholate (G0759), glycocholic acid sodium (G2878), sodium deoxycholate (D2510), sodium glycodeoxycholate (G6132), dibasic sodium phosphate (255793) and citric acid (251275) were purchased from Sigma, USA. Ammonium acetate (101116) was procured from Merck, Germany. Chloroform (288306) and isoamyl alcohol (W205702) were purchased from Sigma-Aldrich, Malaysia. Phenol (UN2821) and sodium dodecyl sulfate (SDS) (151–21-3) were obtained from Amresco, USA. Phusion High-Fidelity DNA Polymerase (F-530 L) was bought from Finnzymes, Finland. BamH I (R013S), Kpn I (R0142S), Nde I (R0111S), Hind III (R0104S), Xba I (R0145S), T4 DNA Ligase (M0202 L) and DNA Polymerase I, Large (Klenow) Fragment (M0210S) were procured from New England Biolabs (NEB), USA. dNTP mix (U1515) was purchased from Promega, USA. PCR primers were obtained from First Base Laboratories. QIAquick Gel Extraction Kit (28704) and Nucleotide Removal Kit (28304) were bought from QIAGEN, Germany. The AF9 gene sequence was accessed from Ensembl database [EMBL:ENSG00000171843]. By using DNASTAR software (Lasergene, USA), MAR/SARs within the AF9 gene were predicted by searching MAR/SAR recognition signature (MRS). MRS is a bipartite sequence strongly related to MAR/SAR . MRS consists of two nucleotide motifs that are found within a distance of 200 bp. The first nucleotide motif is an 8 bp degenerate sequence, AATAAYAA. Exact match is required for this 8 bp sequence. The second nucleotide motif is a 16 bp degenerate sequence, AWWRTAANNWWGNNNC, where Y = C or T; W = A or T; R = A or G; N = A, C, G or T. One mismatch is permitted within the 16 bp sequence. The distance between these two degenerate sequences should be within 200 bp. Each sequence can be found on either Watson (W) strand or Crick (C) strand. The sequences may be overlapping or one precedes the other. When there is more than one motif of either 8 or 16 bp to be found within the constraint of the pattern, they are considered as a single MRS. Besides, when there is more than one MRS to be identified within close proximity, they are regarded as a single potential MAR/SAR site. The locations of the MRS predicted MAR/SARs were compared with the locations of the experimentally determined MAR/SARs identified in previous studies [88, 89]. We have also performed in silico prediction of MAR/SAR in the abelson murine leukaemia viral oncogene homolog 1 (ABL) gene by using MRS . We only found one predicted MAR/SAR site which matches to the experimentally determined MAR/SAR in the ABL gene. However, the distance between the 8 bp sequence element and the 16 bp sequence element was found to be 248 bp. Therefore, in this study, we set the maximal distance between 8 bp sequence element and the 16 bp sequence element at 250 bp. The AF9 gene sequence was further analysed by using two MAR/SAR prediction tools, namely, SMARTest (http://www.genomatix.de)  and MAR-Finder (http://genomecluster.secs.oakland.edu/marwiz/) . NP69 cells were grown in Keratinocyte-SFM medium supplemented with 2% (v/v) heat-inactivated fetal bovine serum, 4–5 ng/ml recombinant Epidermal Growth Factor (rEGF), 40–50 μg/ml Bovine Pituitary Extract (BPE), 100 U/ml penicillin and 100 μg/ml streptomycin. TWO4 cells were grown in RPMI 1640 medium supplemented with 10% (v/v) heat-inactivated fetal bovine serum, 2 mM L-glutamine, 100 U/ml penicillin and 100 μg/ml streptomycin. Cells were cultured with 5% CO2 at 37 °C. The BA cocktail was prepared as previously described . It consists of an equimolar mixture of sodium salts of deoxycholic acid, glycochenodeoxycholic acid, glycocholic acid, glycodeoxycholic acid and taurocholic acid. The concentration of each of the five bile salts was 0.02 mM for a total BA concentration of 0.1 mM. Total BA concentrations in the refluxate of patients with Barrett’s oesophagus were reported to range from 0.03 to 0.82 mM . Higher concentrations of BA (as high as 7.6 mM) have also been observed in the refluxate of some patients with Barrett’s oesophagus . Therefore, in this study, we used a concentration within the physiological range (0.5 mM). In addition, it has been reported that nasopharyngeal reflux was more prevalent in CRS patients. Nasopharyngeal pH less than 5 has been observed in 76% of these nasopharyngeal reflux-related CRS patients . Similarly, in a 24-h pH monitoring study, abnormal nasopharyngeal pH (nasopharyngeal pH mean was 5.6917) has been reported in patients with GORD related-chronic respiratory diseases (otitis, sinusitis, laryngitis, epiglottitis, recurrent stridor, asthma and recurrent pneumonia). A 5.8 nasopharyngeal pH was regarded as the most sensitive and specific cut-off point to show the presence of abnormal pH-metry in the patients with nasopharyngeal reflux related-chronic respiratory diseases . Therefore, in our studies, the BA treatments were performed at neutral pH (pH 7.4) and acidic pH (pH 5.8). The media used for BA treatment at acidic pH were acidified to pH 5.8 with citrate phosphate buffer. NP69 cells (1.5 × 104) and TWO4 cells (2.5 × 104) were seeded in 60 mm culture dishes and allowed to grow for 2 days. NP69 cells were left untreated or treated with 0.5 mM of BA cocktail at pH 7.4 and pH 5.8 for 1 h. TWO4 cells were left untreated or treated with 0.5 mM of BA cocktail at pH 7.4 and pH 5.8 for 3 h.
After exposure, the cells were subjected to genomic DNA extraction by using phenol/chloroform/isoamyl alcohol extraction method as previously described . In order to prepare the DNA for nested IPCR, several manipulation steps were carried out as previously described . The simplified manipulation steps were illustrated in Additional file 1. Firstly, digestion with 100 U of BamH I (RE1 in Additional file 1) was performed. This was followed by Klenow fill-in, ligation and ethanol precipitation. The DNA was either digested with Kpn I (RE2 in Additional file 1) or Nde I (RE3 in Additional file 1). The digested DNA was cleaned up by using QIAGEN QIAquick Nucleotide Removal Kit according to the manufacturer’s protocol. The reaction for nested IPCR consisted of 1X of HF buffer (containing 1.5 mM of MgCl2), 0.5 μM of each reverse primer and forward primer, 200 μM of dNTP mix, 0.4 U of Phusion High-Fidelity DNA Polymerase, and 200 ng of DNA template. Sterile ultrapure water was used to replace DNA template in the negative control. The cycle condition used in the first round was as below: 30 s of 98 °C for 1 cycle (initial denaturation), followed by 30 cycles of 98 °C for 10 s (denaturation), 69 °C for 30 s (annealing), 72 °C for 15 s (extension), followed by 1 cycle of 72 °C for 10 min (final extension). Two μl of 5-fold diluted first round IPCR product was used as DNA template for the second round. The cycle condition used in the second round was similar to that in the first round, except that the annealing temperature was 57 °C. The primers used in the first round of IPCR were 5’-ATTCTAGACCCCAAAAAATTCTCAG-3′ (reverse) and 5’-CTCTTAATGCCACTGCCATGA-3′ (forward), whereas the primers used in the second round were 5’-CATATCCTTTTCATACCTGG-3′ (reverse) and 5’-ATTGGTGTCAATCAAATGC-3′ (forward). The IPCR amplifications were performed by using a Veriti 96 Well Thermal Cycler (Applied Biosystems, USA). The manipulation steps were similar with that of the SAR region, except that Hind III (RE2 in Additional file 1) and Xba I (RE3 in Additional file 1) were used for the AF9 non-SAR region instead of Kpn I and Nde I. The cycle condition used in the first round of IPCR was as below: 30 s of 98 °C for 1 cycle (initial denaturation), followed by 30 cycles of 98 °C for 10 s (denaturation), 64 °C for 30 s (annealing), 72 °C for 22 s (extension), followed by 1 cycle of 72 °C for 10 min (final extension). Two μl of 5-fold diluted first round IPCR product was used as DNA template for the second round. The cycle condition of the second round was similar to that of the first round, except that the annealing temperature was 63 °C and the extension time was 15 s. The primers used for the first round of IPCR were 5′- TACCAAACATTTTGAGTCCTACAG-3′ (reverse) and 5′- GGCATTCAGGTGAGTAGTTTATTC-3′ (forward), whereas the primers used in the second round were 5’-AGCAGTAGACTTTTGTAACCTCAC-3′ (reverse) and 5′- AGGGGATGACTTTTCTTCAATC-3′ (forward). To visualise the AF9 cleaved fragments, the IPCR products were loaded on 1% agarose gel and stained with ethidium bromide. The IPCR bands representing the AF9 cleaved fragments were excised. The IPCR products were extracted by using QIAGEN QIAquick Gel Extraction Kit and sequenced. The sequencing results were then annotated by blasting the human genome database (Nucleotide BLAST, http://blast.ncbi.nlm.nih.gov/Blast.cgi). The breakpoints of the AF9 cleaved fragments were identified by aligning the sequencing data with the AF9 gene sequence retrieved from Ensembl database [EMBL:ENSG00000171843]. This was done by using Seqman DNASTAR software (Lasergene, USA). A genomic map depicting the positions of the chromosome breaks in relation to the chromatin structure was constructed. The IPCR assays were carried out in two to four sets per experiment. Each set of IPCR assay consisted of three to six replicates per cell sample. The gene cleavage frequencies represent the average number of the AF9 cleaved fragments detected in two to three independent experiments. Topo II consensus sites were predicted as previously described [98, 99]. Topo II consensus site was proposed to be associated with an 18 bp DNA sequence, 5’RNYNNCNNGYNGKTNYNY 3′. There are ten specific and eight non-specific nucleotides in this sequence. One mismatch is allowed for the ten of the specific nucleotides in one DNA strand whereas five mismatches are allowed in the opposite strand. Data were presented as means with standard deviation (SD). Student’s t-test was used to evaluate the significance of differences between the untreated control and the treated groups in flow cytometric analyses and IPCR assays. Mann-Whitney U test was used to evaluate the significance of differences in cleavage frequencies between the SAR region and non-SAR region. All statistical tests were two-sided. Differences were considered statistically significant at p-value < 0.05. This study targeted the AF9 gene located at 9p22. The AF9 gene is 280,880 bp in length [EMBL:ENSG00000171843]. It consists of 10 exons (Additional file 2). Potential MAR/SAR sites in the AF9 were predicted by MAR/SAR recognition signature (MRS). MRS was proposed to be strongly associated with MAR/SAR . Forty-one MRS predictions were found in the AF9 gene. These 41 MRS correspond to 29 MAR/SAR candidates, as some of the MRSs which cluster within close proximity were regarded as a single potential MAR/SAR site. Table 1 shows the nucleotide positions of the MRSs with their sequence composition, relative orientation, distance between the two sequence elements and location of the MRSs in the exon or intron of the AF9 gene. Intron 2 with 164 kb in length is the largest intron of the AF9 gene. Almost half of the MAR/SAR sites (14 out of the 29 predicted MAR/SARs) were found in this largest intron (MAR/SARs 2–15 in Table 1). Both intron 3b (MAR/SARs 17–21 in Table 1) and intron 4 (MAR/SARs 22–26 in Table 1) were found to contain five MAR/SAR sites. Two potential MAR/SAR sites (MAR/SARs 27–28 in Table 1) were identified in intron 7. Intron 1 (MAR/SAR 1 in Table 1), intron 3a (MAR/SAR 16 in Table 1) and intron 9 (MAR/SAR 29 in Table 1) were all found to contain one MAR/SAR site. Figure 1 (yellow arrows) shows the distribution of the MRS predicted MAR/SAR sites in the AF9 gene. Two experimentally determined MAR/SARs have been reported in the previous study. These two MAR/SARs were designated as SAR1 and SAR2. SAR1 is located in intron 4. SAR2 spans from exons 5 to 7 . Based on the locations of the previously reported biochemically defined MAR/SAR sites and the presently predicted MAR/SAR sites, a SAR region (contains MAR/SAR) and a non-SAR region (does not contain MAR/SAR) were determined as the region of our study (Fig. 1). The AF9 SAR region contains one MRS- predicted MAR/SAR site (MAR/SAR 24) which matches to the biochemically defined SAR1. By contrast, the AF9 non-SAR region is a region which does not contain any biochemically extracted MAR/SAR or MRS- predicted MAR/SAR. The AF9 sequence was further analysed by using two MAR/SAR prediction programs, namely SMARTest (http://www.genomatix.de) and MAR-Finder (http://genomecluster.secs.oakland.edu/marwiz/). The distribution of MAR/SARs predicted by SMARTest and MAR-Finder were shown in Fig. 1 (blue and red arrows, respectively). Table 2 shows the nucleotide position of the potential MAR/SAR sites identified by SMARTest. There were 51 MAR/SARs predicted within the AF9 gene. There was no MAR/SAR predicted within the non-SAR region. The closest MAR/SAR at its 5′ site locates at coordinates 66,686–67,255 (MAR/SAR 14 in Table 2) while the closest MAR/SAR at its 3′ site locates at coordinates 85,486–85,800 (MAR/SAR 15 in Table 2). On the other hand, there were four MAR/SARs predicted within the SAR region. These four MAR/SARs locate at coordinates 237,321–237,855, 240,926–241,315, 244,311–244,710 and 245,416–245,850 (MAR/SARs 46–49 in Table 2). The locations of these four SMARTest- predicted MAR/SARs match to the experimentally determined SAR1 (Fig. 1). 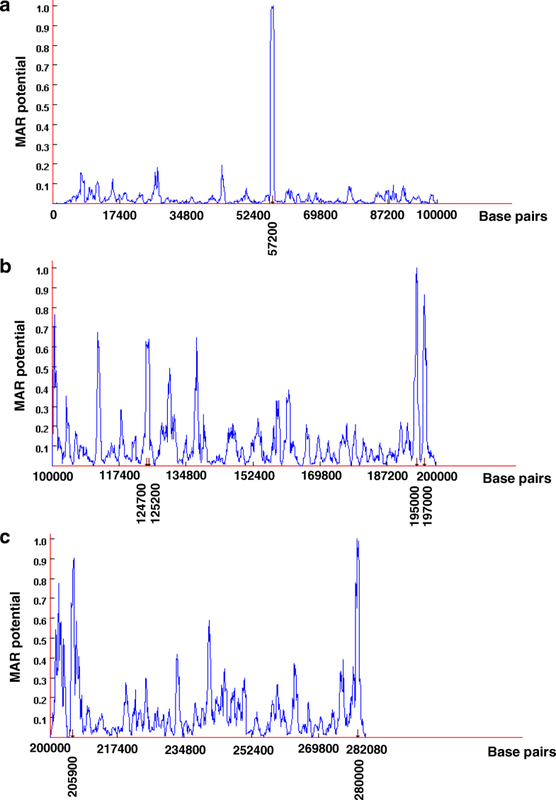 Figures 2 a, b and c show the MAR-Finder predicted MAR/SARs within the AF9 gene for coordinates 0–100,000, 100,000–200,000 and 200,000–282,080, respectively [Ensembl:ENSG00000171843]. 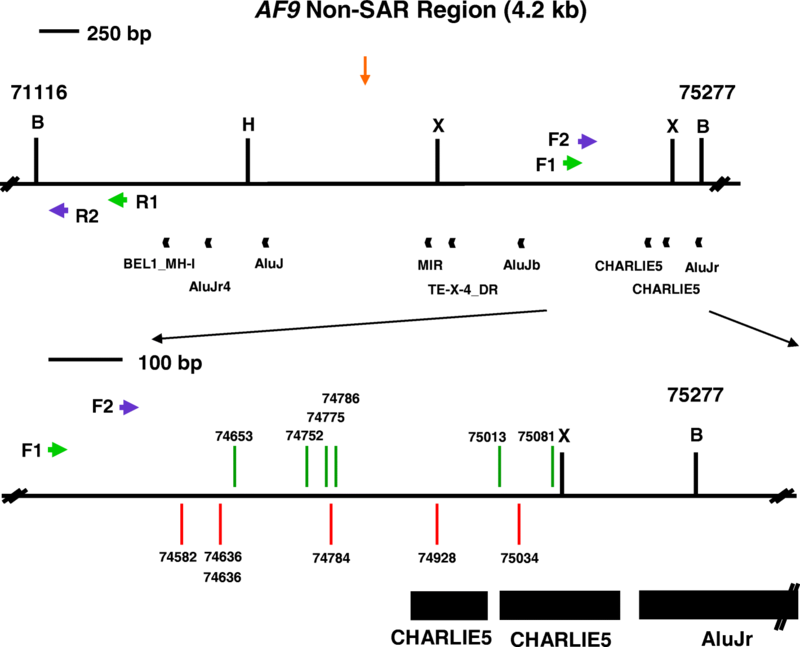 MAR-Finder predicted seven MAR/SAR sites within the AF9 gene. These seven potential MAR/SARs locate at 57200 (Fig. 2 a), 124,700, 125,200, 195,000, 197,000 (Fig. 2 b), 205,900 and 280,000 (Fig. 2 c). There was no MAR/SAR predicted within the SAR region or the non-SAR region. Nested IPCR was employed to investigate if BA-induced apoptosis does lead to cleavage in the AF9 SAR and non-SAR regions. Genomic DNA extraction and subsequent IPCR were performed on BA-treated NP69 and TWO4 cells. Based on the primers position, if there is no chromosomal breakage detected, the IPCR product for the SAR region of the AF9 gene will be 944 bp (~ 950 bp), while for the non-SAR region of the AF9 gene, the IPCR product will be 956 bp (~ 950 bp). If there is any chromosomal breakage detected, for both SAR and non-SAR regions, IPCR products of less than 950 bp will be obtained. For the SAR region, NP69 cells treated with BA at pH 7.4 (Lanes 6–9) and pH 5.8 (Lanes 13–15) showed numerous IPCR bands of less than 950 bp (Fig. 3a i). These bands represent the AF9 gene cleavages within the SAR region. Two IPCR bands were also detected in the untreated NP69 cells (Lanes 3 and 4). By using flow cytometric analyses, we have demonstrated that untreated control contained a small percentage of apoptotic cells . The background might be contributed by endogenous DNA breaks which occur in these dying cells. As shown in Fig. 3b left columns, the AF9 gene cleavage frequency detected in NP69 cells treated with BA at pH 7.4 was approximately 3.9-fold higher than that in untreated NP69 cells (p-value = 0.015). It was 4.9-fold higher than that of untreated control in cells exposed to BA at pH 5.8 (p-value = 0.032). As for the non-SAR region, untreated NP69 cells (Lanes 1–6), and NP69 cells treated with BA at pH 7.4 (Lanes 7–10 and 12) and pH 5.8 (Lanes 13–18) showed numerous IPCR bands of less than 950 bp (Fig. 3a ii). These bands represent the AF9 gene cleavages within the non-SAR region. There was no significant difference in the cleavage frequency between untreated NP69 cells and NP69 cells treated with BA at pH 7.4 (p-value = 0.807) or pH 5.8 (p-value = 0.086) (Fig. 3b right columns). Similar results were observed in TWO4 cells. Numerous IPCR bands of less than 950 bp were detected in TWO4 cells after treatment with BA at pH 7.4 (Fig. 4a i, Lanes 8–12) and pH 5.8 (Fig. 4a i, Lanes 13–18). These bands represent cleaved AF9 gene within the SAR region. A few IPCR bands were also detected in the untreated TWO4 cells (Fig. 4a i, Lanes 1–3) which might be due to spontaneous DNA breaks. The AF9 gene cleavage frequencies of TWO4 cells treated with 0.5 mM of BA at neutral pH and acidic pH are 1.8-fold (p-value = 0.004) and 1.6-fold (p-value = 0.036) higher than that of the untreated control, respectively (Fig. 4b left columns). As for the non-SAR region, numerous IPCR bands of less than 950 bp were detected in untreated TWO4 cells (Fig. 4a ii, Lanes 1–6), and TWO4 cells treated with BA at pH 7.4 (Fig. 4a ii, Lanes 7–12) and pH 5.8 (Fig. 4a ii, Lanes 13–16 and 18). These bands represent cleaved AF9 gene within the non-SAR region. As summarised in the bar chart in Fig. 4b (right columns), there was no significant difference in the cleavage frequency of the AF9 non-SAR region between untreated TWO4 cells and TWO4 cells treated with BA at pH 7.4 (p-value = 0.903) or pH 5.8 (p-value = 0.429). These findings clearly demonstrate that MAR/SAR mediates the gene cleavages in BA-induced apoptosis in NP69 and TWO4 cells at both neutral and acidic pH. However, in both NP69 and TWO4 cells, there were obviously more cleavage bands detected in the non-SAR region (Figs. 3a ii and 4a ii) as compared with the SAR region (Figs. 3a i and 4a i). Table 3 shows the differences in the cleavage frequencies between SAR and non-SAR regions. The cleavage frequencies of the non-SAR region detected in untreated NP69 and TWO4 cells were 4.0-fold (p-value = 0.001) and 5.7-fold (p-value < 0.001) higher than those of the SAR region, respectively. It is possible that other chromatin structures may have contributed to DNA fragility of the AF9 non-SAR region. In addition to MAR/SAR sequence, repeat elements and topoisomerase II (topo II) cleavage site have also been well implicated in mediating chromosome breaks [88, 89, 100]. Hence, this prompted us to investigate the possibility of repeat elements and topo II cleavage site in contributing to DNA fragility of the AF9 non-SAR region. By using CENSOR program (https://www.girinst.org/censor/), repeat elements were identified in the AF9 gene. Tables 5 and 6 show the repeat elements identified within the SAR and non-SAR regions, respectively. Eighteen repeat elements were identified within the 10.2 kb SAR region (Table 4). The overall content of repeat elements in the SAR region is 13.81%. Only one out of these 18 repeat elements is found within the amplified region. ERE2_EH (coordinates 245,627–245,728, 102 bp in length) is the only one repeat element identified within the amplified region. This repeat element occupies 11% (102 bp) of the amplified SAR region (944 bp). On the contrary, nine repeat elements were identified within the 4.2 kb non-SAR region (Table 5). The overall content of repeat elements in the non-SAR region is 41.37%. Three out of these nine repeat elements are found within the amplified region. The three repeat elements identified in this region were two CHARLIE5 (coordinates 74,895–74,998, 104 bp in length and coordinates 75,006–75,169, 164 bp in length) and one AluJr (coordinates 75,192–75,466, 275 bp in length). These three repeat elements take up 57% (543 bp) of the amplified non-SAR region (956 bp). The locations of repeat elements identified within the SAR and non-SAR regions are illustrated in Fig. 5. Table 6 and Fig. 5 summarise the topo II consensus sites predicted in the AF9 SAR and non-SAR regions. We predicted eight topo II consensus sites in the AF9 SAR region. The overall content of topo II sites in the SAR region is 1.41%. Two topo II consensus sites fall within the breakpoint cluster region, BCR1. Five topo II consensus sites were found within the biochemically identified MAR/SAR, SAR1. One topo II site was identified next to SAR1. Two out of the eight topo II consensus sites were found within the amplified region. These two topo II consensus sites occupy 3.81% of the amplified region. In contrast to the SAR region, only one topo II consensus site was predicted within the AF9 non-SAR region. The overall content of topo II sites in the non-SAR region is 0.43%. This topo II consensus site is not located within the amplified region. To ascertain that the cleavage fragments identified in IPCR were derived from the cleaved AF9 gene, some of the IPCR bands were excised, purified and sequenced. The sequencing results show that these fragments were all derived from the cleaved AF9 gene. 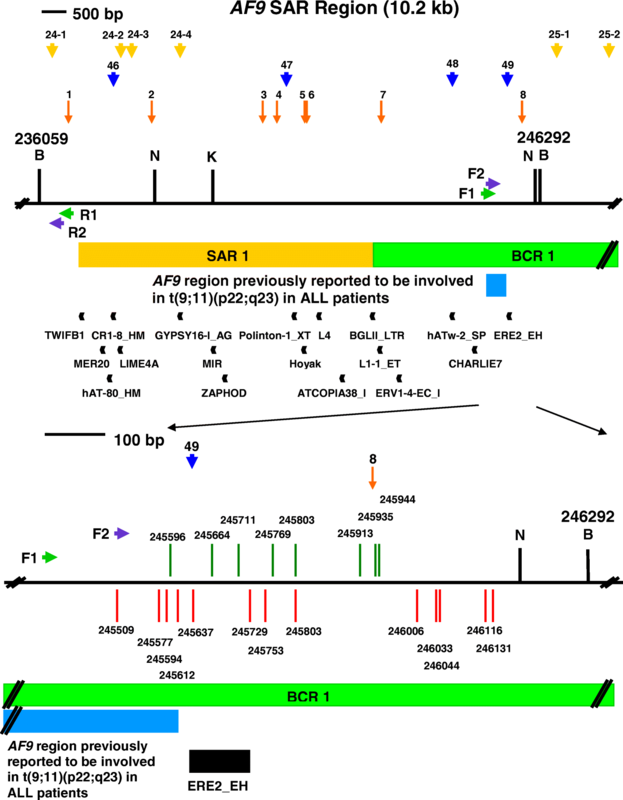 The breakpoints identified within the AF9 SAR region in BA-treated NP69 and TWO4 are shown in Tables 7 and 8, respectively. Intriguingly, several breakpoints (at coordinates 245,509, 245,527, 245,575, 245,577, 245,594, 245,596 and 245,612) were mapped within the AF9 region (at coordinates 245,252–245,612) which was previously reported to be involved in t(9;11)(p22;q23). This chromosome translocation resulted in the formation of mixed lineage leukaemia (MLL)-AF9 fusion gene in acute lymphoblastic leukaemia (ALL) patient [GenBank:AM050804]. It is noteworthy that one of the presently identified breakpoints is identical with that identified in the ALL patient (at coordinate 245,612) [GenBank:AM050804]. This chromosome break falls within the AF9 region (at coordinates 245,252–245,612) that was previously reported to translocate with the MLL gene leading to the formation of the MLL-AF9 fusion gene in an ALL patient [GenBank:AM050804]. This breakpoint is identical with a breakpoint identified in TWO4 cells treated with BA at pH 7.4. This chromosome break falls within the AF9 region (at coordinates 245,252–245,612) that was previously reported to be involved in the formation of the MLL-AF9 fusion gene in an ALL patient. This breakpoint is three nucleotides different from that reported in cultured normal blood cells treated with VP16 (at coordinate 245,593) , five nucleotides different from a breakpoint detected in H2O2-treated NP69 cells (at coordinate 245,591) and six nucleotides different from that identified in H2O2-treated HK1 cells (at coordinate 245,590) . This chromosome break falls within a repeat ERE2_EH (at coordinates 245,627–245,728). This breakpoint is nine nucleotides different from that identified in an ALL patient (at coordinate 245,612) [GenBank:AM050804]. This breakpoint is four nucleotides different from that reported in H2O2-treated NP69 cells (at coordinate 245,703) . This chromosome break falls within a repeat ERE2_EH (at coordinates 245,627–245,728). This breakpoint is five nucleotides different from that reported in H2O2-treated NP69 cells (at coordinate 245,703) . This chromosome break falls within a repeat ERE2_EH (at coordinates 245,627–245,728). This breakpoint is six nucleotides different from that reported in H2O2-treated NP69 cells (at coordinate 246,000) . This breakpoint is identical with a breakpoint identified in NP69 cells treated with BA at pH 7.4. This chromosome break falls within the AF9 region (at coordinates 245,252–245,612) previously reported to be involved in the formation of the MLL-AF9 fusion gene in an ALL patient [GenBank:AM050804]. This breakpoint is three nucleotides different from that reported in cultured normal blood cells treated with VP16 (at coordinate 245,593) , five nucleotides different from that detected in H2O2-treated NP69 cells (at coordinate 245,591) and six nucleotides different from that identified in H2O2-treated HK1 cells (at coordinate 245,590) . This breakpoint is five nucleotides different from that (at coordinate 245,659) identified in NP69 cells treated with H2O2 . This chromosome break falls within a repeat ERE2_EH (at coordinates 245,627–245,728). This breakpoint is identical with that identified in TWO4 cells treated with BA at pH 5.8. This chromosome break falls within the AF9 region (at coordinates 245,252–245,612) that was previously reported to translocate with the MLL gene leading to the formation of the MLL-AF9 fusion gene in an ALL patient [GenBank:AM050804]. This breakpoint is one nucleotide different from that reported in cultured normal blood cells treated with VP16 (at coordinate 245,593) , three nucleotides different from that detected in H2O2-treated NP69 cells (at coordinate 245,591), and four nucleotides different from that identified in H2O2-treated HK1 cells (245590) . This breakpoint is identical with the breakpoint previously identified in an ALL patient [GenBank:AM050804]. This breakpoint is identical with a breakpoint identified in TWO4 cells treated with BA at pH 7.4, and seven nucleotides different from that (at coordinate 245,796) reported in NP69 cells treated with H2O2 . This breakpoint is six nucleotides different from that (at coordinate 246,000) reported in NP69 cells treated with H2O2 . This breakpoint is two nucleotides different from a breakpoint (at coordinate 246,114) reported in CEM cells exposed to VP16 , and three nucleotides different from that (at coordinate 246,113) identified in NP69 cells treated with H2O2 . A breakpoint (at coordinate 245,596) was simultaneously mapped in both NP69 and TWO4 cells treated with BA at neutral pH. Another breakpoint (at coordinate 245,803) was simultaneously detected in TWO4 cells treated with BA at both neutral and acidic pH. Three breakpoints (at coordinates 245,594, 245,596 and 246,116) are similar with those reported in cultured normal blood cells (at coordinate 245,593) and CEM cells (at coordinate 246,114) exposed to etoposide (VP16) . A few breakpoints (at coordinates 245,594, 245,596, 245,664, 245,699, 245,708, 245,803, 245,994, 246,006 and 246,116) are similar with those identified in H2O2-treated NP69 cells (at coordinates 245,591, 245,659, 245,703, 245,796, 246,000 and 246,113) and HK1 cells (at coordinate 245,590) reported in our previous study . In addition, a few chromosome breaks (at coordinates 245,637, 245,649, 245,664, 245,699, 245,708, 245,711, 245,721 and 245,725) fall within a repeat ERE2_EH (at coordinates 245,627–245,728). A map representing the positions of BA-induced chromosome breaks in NP69 and TWO4 cells within the AF9 SAR region is illustrated in Figs. 6 and 7, respectively. Tables 9 and 10 show the breakpoints identified within the AF9 non-SAR region in BA-treated NP69 and TWO4 cells, respectively. One breakpoint was simultaneously detected in two different IPCR replicates which were from two different sets of IPCR derived from NP69 treated with BA at acidic pH. Six chromosome breaks (at coordinates 74,908, 74,914, 74,928, 74,953 and 74,987) fall within the first repeat CHARLIE5 (at coordinates 74,895–74,998). Four chromosome breaks (at coordinates 75,013, 75,034, 75,043 and 75,081) fall within the second repeat CHARLIE5 (at coordinates 75,006–75,169). 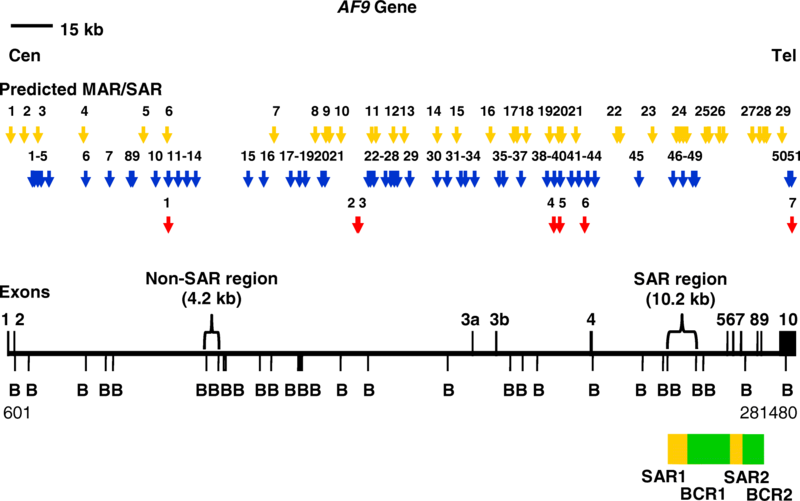 The genomic maps representing the positions of chromosome breaks within the AF9 non-SAR region detected in NP69 and TWO4 cells are elucidated in Figs. 8 and 9, respectively. This chromosome break falls within a repeat CHARLIE5 (at coordinates 75,006–75,169). Identical breakpoints detected in different IPCR replicates which were from two different sets of IPCR. This chromosome break falls within a repeat CHARLIE5 (at coordinates 74,895–74,998). Lately, the association between chronic inflammation of sinonasal tract and NPC has increasingly received much attention . One of the major risk factors for the development of CRS is GORD [42, 43, 102]. It has been demonstrated that gastric duodenal refluxate can reach the larynx, pharynx, oral cavity, nasopharynx, nose, sinus, eustachian tube and middle ear. Repeated exposure to gastric duodenal content may result in localised inflammation of these regions [18, 20, 43, 103–106]. More recently, BA has been shown to cause cell injury and inflammation in the airway epithelium. Treatment of the immortalised human bronchial epithelial cells (BEAS-2B) with BA resulted in increased activity of proinflammatory cytokines (interleukin-8 and interleukin-6) . The airways do not have intrinsic protective mechanisms as found in the oesophagus. Therefore, the tissues of airways are more vulnerable to acid-peptic injury as compared with the oesophagus. Due to this reason, it is conceivable that when the tissues of airways are repeatedly exposed to the gastric duodenal refluxate, the genotoxicity and mutagenicity of gastric duodenal content may also contribute to carcinogenesis in the airways . By using flow cytometric analyses of phosphatidylserine (PS) externalisation and mitochondrial membrane potential (MMP) disruption, we have previously demonstrated that BA induced apoptosis in normal nasopharyngeal epithelial cells (NP69) and NPC cells (TWO4) . We further demonstrated that BA-induced apoptosis triggered oxidative stress and caspase activity. These events, in turn, resulted in cleavages within the AF9 BCR. These cleavages were abolished by the caspase inhibitor, suggesting that these cleavages were mediated CAD. Our findings suggested that one of the potential mechanisms contributing to chromosome rearrangement in NPC could be BA-induced apoptosis, where CAD may be involved . In the present report, we intended to investigate the relation between the positions of BA-induced chromosomal cleavages and the chromatin structure. It has been known that the BCRs of the AF9 and MLL genes share similar structural elements. These structural elements include MAR/SAR, topo II cleavage site and DNase I hypersensitive site. The similarity in the structural features in the BCRs of the AF9 and MLL genes has been suggested to serve as recombination hot spots leading to the formation of the MLL-AF9 fusion gene in leukaemogenesis . MAR/SARs are DNA sequences that are responsible for chromosomal loop attachment . Topo II cleavage site and DNase I hypersensitive site frequently co-localise with MAR/SAR [109–111]. Therefore, we attempted to study the role of MAR/SAR in determining the positions of chromosomal cleavages in BA-induced apoptosis. The targeted gene in this study was the AF9 gene located on the short arm of chromosome 9 at position 9p22, a common deletion region in NPC. The AF9 gene frequently translocates with the MLL gene at 11q23 resulting in the reciprocal translocation t(9;11)(p22;q23) in leukaemia . The fusion of these two genes has been found to occur predominantly among the patients with de novo acute myelogenous leukaemia (AML). The MLL-AF9 fusion gene was less commonly observed in patients with acute lymphocytic leukaemia (ALL), with myelodysplastic syndrome (MDS) and with therapy-related AML (t-AML) [88, 112]. In the present study, possible MAR/SAR sites in the AF9 gene were predicted by using MRS. MRS is a bipartite sequence element which has been strongly associated with MAR/SARs. MRS is composed of two individual sequence elements which are found together within a distance of approximately 200 bp. However, when the DNA is wrapped around the histones, these two sequence elements exist at a location near the dyad axis of the nucleosome. Hence, they are found parallel to each other in MAR/SAR when the nucleosomes are positioned. This allows them to generate a protein binding site in MAR/SAR. van Drunen and co-workers have analysed more than 300 kb of DNA sequences from several eukaryotic organisms by using MRS. Their studies reported that all the MRS predictions were associated with the experimentally determined MAR/SARs . MRS has been widely used in other studies and proved to be reliable [113–115]. The MRS predictions obtained in the present study were compared with the location of experimentally determined MAR/SARs reported in the previous studies [88, 89]. Strissel and co-workers have analysed exons 4 to 10 of the AF9 gene for MAR/SAR. In this region of 61 kb in length, two biochemically extracted MAR/SARs have been reported. These two MAR/SARs were indicated as SAR1 and SAR2. SAR1 is a 6.2 kb MAR/SAR found in intron 4. SAR2 is a 4.6 kb MAR/SAR spans through parts of introns 5 to 7 . To the best of our knowledge, there is no previous report on the experimentally determined MAR/SAR for the AF9 region from exon 1 to intron 3. Four MRS predictions (MAR/SARs 24–1 to 24–4 in Fig. 1) are associated with SAR1. One of these four MRSs was located in a region < 1 kb centromeric to SAR1 (MAR/SAR 24–1 in Fig. 1), whereas the other three MRSs were found within SAR1 (MAR/SARs 24–2 to 24–4 in Fig. 1). One MRS prediction (MAR 27 in Fig. 1) correlates with SAR2. This MRS was found in a region < 1.5 kb telomeric to SAR2. 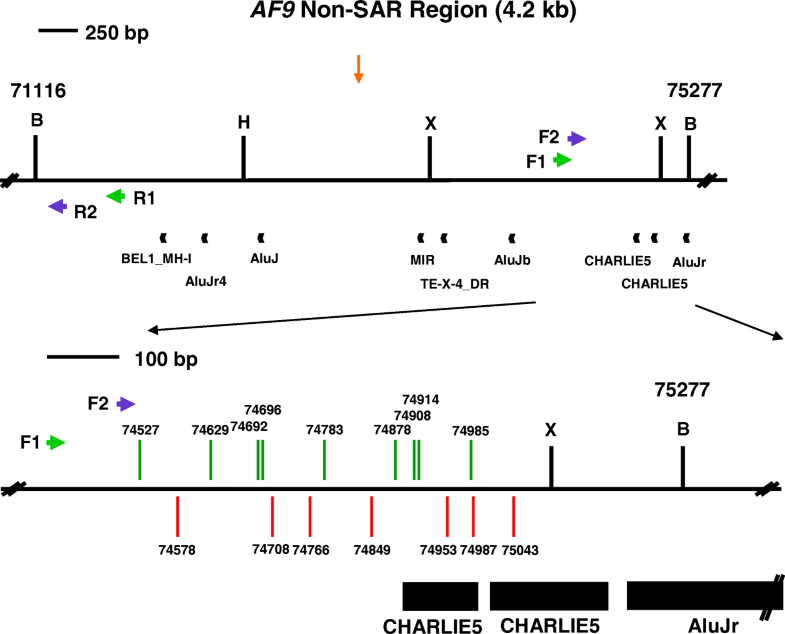 Interestingly, all the MRS-predicted MAR/SARs were found in the introns of the AF9 gene. These results are consistent with those of the other studies which found that MAR/SARs occur more frequently in introns than in exons. This has been previously confirmed by both the experimental extraction [116, 117] and computational prediction . Based on the in silico prediction and the previous studies which reported the experimentally determined MAR/SARs , the SAR and non-SAR regions were determined (Fig. 1). A study by van Drunen and colleagues (1999) showed that they never found a MRS which did not correlate with an experimentally verified MAR/SAR. However, their studies also revealed that not all biochemically defined MAR/SARs contain a MRS. Their findings suggested that there is at least a distinct type of MAR/SAR which does not contain a MRS . Thus, in order to investigate if the region which was considered as a non-SAR region contains another type of MAR/SAR which was not predicted by MRS, we further analysed the AF9 sequence by predicting the presence of MAR/SAR using MAR-Finder and SMARTest. The MAR/SAR analysis rules utilised in these two programs are different from the criteria used in the MAR/SAR prediction by MRS. MAR-Finder utilises statistical inference to predict the occurrence of MAR/SARs. MAR-Finder was developed by using the formulation of a set of biological rules based on the correlation of MAR/SAR with various DNA sequence motifs. These motifs include the TG-rich sequences, origin of replication (ORI), kinked DNA, curved DNA, AT-rich sequences and topo II sites. MAR-Finder has been shown to successfully identify MAR/SAR sites which correlate with those experimentally verified in the human beta-globin gene, PRM1-PRM2-TNP2 domains and human apolipoprotein B locus . By contrast, SMARTest predicts MAR/SARs based on a density analysis of MAR/SAR-associated features described by a weight matrix library . This MAR/SAR matrix library was mainly derived from the following MAR/SAR-associated patterns. Firstly, MAR/SARs have a minimum sequence length of 200–300 bp . Secondly, MAR/SAR sequences are AT-rich . Thirdly, MAR/SARs are associated with a few motifs. These motifs include ATTA, ATTTA, AATATT, ATATTT and AATATATTT [85, 118–121]. In order to evaluate the capability of SMARTest, Frisch and co-workers analysed six genomic sequences (three human sequences and three plant sequences) with a total of 310 kb in length by using SMARTest. These six genomic sequences contain a total of 37 experimentally determined MAR/SARs. Their studies showed that 19 of 28 SMARTest predictions were true positives (specificity = 68%). These 19 true positives only correlate with 14 of 37 biochemically extracted MAR/SARs in these genomic sequences (sensitivity = 38%), as some of the MAR/SARs contain more than one SMARTest predictions. For comparison, the authors analysed the same six sequences by using MAR-Finder. Twenty of 25 MAR-Finder predictions were true positives (specificity = 80%). These 20 true positives only correlate with 12 of 37 biochemically extracted MAR/SARs in these sequences, as some of the MAR/SARs contain more than one MAR-Finder predictions (sensitivity = 32%) . Given that the MAR/SAR matrix library utilised by SMARTest was derived from AT-rich MAR/SAR, other MAR/SAR classes distinct from AT-rich class were not predicted by SMARTest. However, these MAR/SAR classes distinct from AT-rich class were found by MAR-Finder. Frisch and co-workers further found that some of the experimentally determined MAR/SARs which were not identified by MAR-Finder were detected by SMARTest. Hence, SMARTest and MAR-Finder were suggested to mutually complete each other in MAR/SAR prediction . Due to a lack of report on the experimentally determined MAR/SARs for the AF9 region from exon 1 to intron 3 (approximately 220 kb in length), the sensitivity and specificity of MRS, SMARTest and MAR-Finder were unable to be compared in this study. Nevertheless, the comparison of accuracy among these prediction tools was not the aim of this study. The main purpose of using these different MAR/SAR prediction tools was to predict the MAR/SARs of different classes. By using MRS, SMARTest and MAR-Finder for MAR/SAR prediction, our findings suggested that the non-SAR region does not contain any MAR/SAR (Fig. 1). Given that chromosomal cleavage is an initial event in both apoptosis and chromosome rearrangements, we employed nested IPCR to identify the chromosome breaks mediated by BA-induced apoptosis. Our findings showed that, for the SAR region, the cleavage frequencies in BA-treated cells were significantly higher than those in the untreated control. On the contrary, for the non-SAR region, there was no significant difference in the cleavage frequencies between the BA-treated cells and untreated control cells. These observations were true for both NP69 and TWO cell lines. However, in both untreated NP69 and TWO4 cells, the cleavage frequencies of the non-SAR region were significantly higher than those of the SAR region. By using CENSOR program, we found that the overall content of repeat elements in the non-SAR region is 3.0-fold higher (41.37% vs 13.81%) than that in the SAR region. Considering that no significant difference in the cleavage frequencies of the non-SAR region was found between the untreated and BA-treated cells, it seems not unlikely that the chromosome breaks in the non-SAR region were not mediated by BA-induced apoptosis. Rather, the chromosome breaks detected in this region were mostly spontaneous breaks due to DNA fragility contributed by these repeat elements. It is likely that repeat elements make the chromosome to be more prone to cleavage. These results are consistent with those of the other studies which reported a high proportion of repeat elements in common fragile sites, including FRA3B, FRA7G, FRA7H, FRA16D and FRAXB. These repeat elements include interspersed repeat elements, long terminal repeats (LTR), transposable elements, Mirs, L1 elements, L2 elements and Alu elements [122, 123]. Therefore, we concluded that MAR/SAR may play an essential role in mediating the gene cleavages in BA-induced apoptosis in NP69 and TWO4 cells at both neutral and acidic pH. Knowing that topo II was involved in mediating illegitimate recombination [124, 125], we further analysed the SAR and non-SAR regions for topo II consensus sites. The topo II consensus sites were predicted by using an 18 bp consensus sequence [98, 99]. Our findings showed that the proportion of topo II sites in the SAR region was approximately 3-fold higher than that in the non-SAR region (1.41% vs 0.43%). These results seemed to reaffirm the findings of those studies which unravelled that MAR/SARs are the dominant sites for topo II binding and cleavage [109, 126]. In an in vitro system, topo II has been demonstrated to play a critical role in mediating DNA cleavages at acidic pH. Topo II has also been shown to be involved in mediating mutation and cytotoxicity induced by acidic pH in tissue culture models. These findings suggested that topo II-mediated DNA damage may lead to the development of cancers associated with gastro-oesophageal acid reflux . In addition, previous studies have demonstrated that topo II is responsible for chromosomal loops excision in the early stage of apoptosis induced by oxidative stress. This initial event was followed by activation of nucleases leading to degradation of chromosomal DNA into nucleosomal DNA . Our previous study has shown that BA and/or acidic pH induced apoptosis via oxidative stress in nasopharyngeal epithelial cells. In BA-induced apoptosis, we demonstrated that DNA cleavages within the SAR region occurred in a caspase-3-dependent manner, suggesting that CAD is responsible for these DNA cleavages . Besides, we have also previously demonstrated that CAD cleaves the DNA preferentially at MAR/SAR sites during oxidative stress . It has been observed that CAD was closely associated with the nuclear matrix of apoptotic cells . It is conceivable that when CAD binds to the nuclear matrix during apoptosis, CAD preferentially cleaves the DNA at MAR/SAR sequences. It is possible that in BA and/or acidic pH-induced apoptosis, which involves oxidative stress, both topo II and CAD do play a role in mediating the DNA cleavages. The former may take part in mediating the cleavage of loop-sized DNA into HMW fragments whereas the latter may involve in mediating the degradation of chromosomal DNA into nucleosomal DNA. Therefore, our current findings which revealed that BA-induced apoptosis resulted in DNA cleavages within the SAR region may be explained by the close relation among topo II, CAD and MAR/SAR. Sequencing of IPCR bands detected in the SAR region showed the positions of chromosome breaks within the AF9 BCR1 mediated by BA-induced apoptosis. 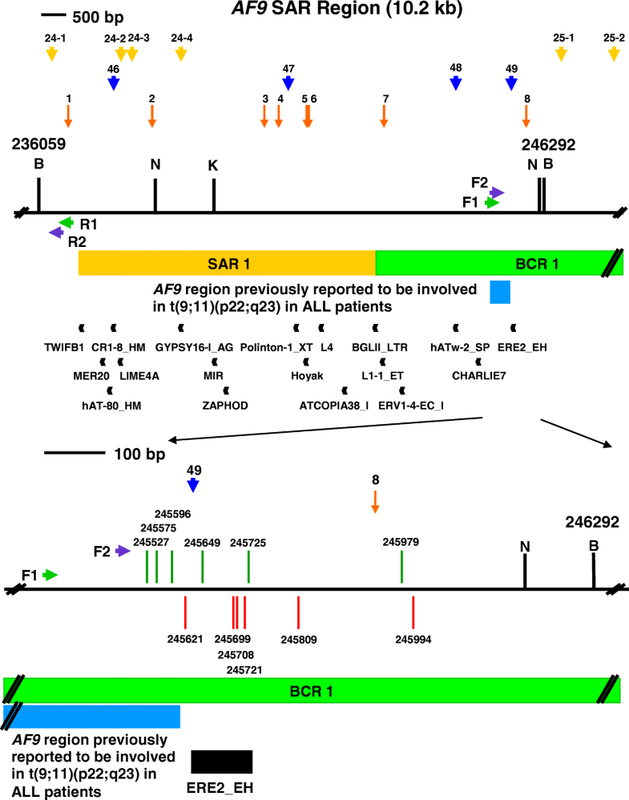 The AF9 BCR1 is bordered by SAR1 and SAR2 [88, 89]. It is noteworthy that the positions of the chromosome breaks identified in the present study were highly similar to those previously reported in leukaemia patients. A few chromosome breaks were mapped within the AF9 region that was previously reported to translocate with the MLL gene in an ALL patient. This reciprocal translocation t(9;11)(p22;q23) resulted in the formation of MLL-AF9 fusion gene in the ALL patient [GenBank:AM050804]. Additionally, we identified a breakpoint which is identical with that identified in the ALL patient [GenBank:AM050804]. In summary, our current results reaffirm our previous findings that BA-induced apoptosis may cause chromosomal breakages in nasopharyngeal epithelial cells. In addition, our findings further implicate that MAR/SAR, which has a close association with topo II and CAD, plays a critical role in determining the positions of BA-induced chromosomal breakages. The positions of these BA-induced chromosome breaks shared high similarity with those identified in patients with leukaemia. Given that chromosomal breakage is an initial event of chromosome rearrangement and that cells may survive apoptosis upon compromised DNA repair, repeated exposure of nasopharyngeal epithelial cells to acid refluxate may contribute to genomic instability. The elevated mutation rate may in turn lead to the development of NPC. In order to clarify the relation between GOR and NPC, there are a few questions remain to be answered by further investigations: (i) Whether GOR may directly contribute to the pathogenesis of NPC through the cytotoxicity and genotoxicity driven by acid refluxate? (ii) Whether GOR may indirectly contribute to the pathogenesis of NPC through chronic inflammation of sinonasal tract (such as CRS) that has been recognised as a precursor of NPC? (iii) Whether both chronic inflammation of sinonasal tract and NPC share a similar underlying mechanism contributed by GOR? Nevertheless, our findings have unfolded the potential role of refluxed gastro-duodenal contents in contributing to NPC chromosome rearrangements. We sincerely thank Prof. Tsao Sai Wah (The University of Hong Kong, Hong Kong, China) and Prof. Lo Kwok Wai (The Chinese University of Hong Kong, Hong Kong, China) for providing the normal nasopharyngeal epithelial cell line (NP69). We express our gratitude to Prof. Sam Choon Kook (formerly from University of Malaya, Malaysia) for providing the NPC cell line (TWO4). We are deeply grateful to Universiti Malaysia Sarawak for all infrastructure support. We would like to acknowledge Ministry of Higher Education Malaysia for the MyBrain15 (MyPhd) Postgraduate Scholarship and the Fundamental Research Grant [FRGS/SKK01(01)/977/2013 (18)] that supported this work. The project was funded by Ministry of Higher Education Malaysia [MOHE Fundamental Research Grant, grant number: FRGS/SKK01(01)/977/2013 (18)]. SNT conducted all the experimental work, carried out the in silico predictions of chromatin structural elements (MAR/SAR, repeat element and topo II cleavage site), performed data analyses, constructed the genomic maps and wrote the manuscript. SPS contributed to the conception and design of the study, interpreted the data, edited the manuscript and supervised the whole project. Both authors read and approved the final manuscript.